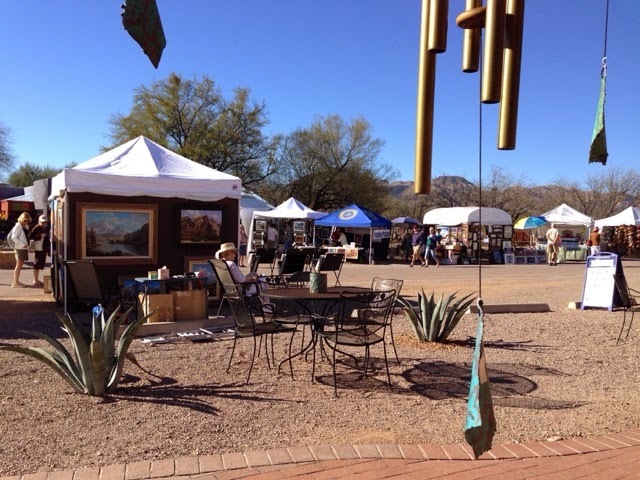 I had in my sights going to Tubac, AZ Art Festival and today was a wonderful weather day with am temps 53 and highs at 80. The fair didn't start until 10:00 but I decided to go early as it does get crowded. Tubac is south of Tucson on I19 headed to the Mexican Border at Nogalas. I arrived at 9:30 and the initial parking area was nearly full. It just so happened that they had a couple of small car spots open very close and the man on the 2-way radio says the size of a Prius and there I was in my Prius. 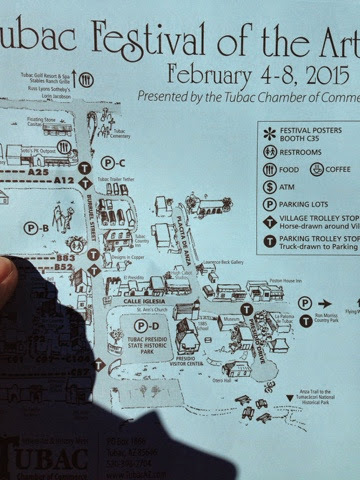 $8.00 fee for parking and no entrance fee. I was told that the money from the parking helps the school. Tucac does not look like an old western town as it is filled with small gift shops art studios, restaurants and galleries. 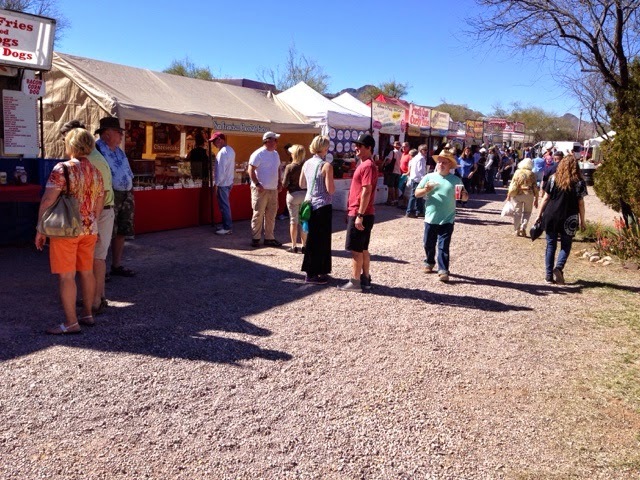 Today they allow outside vendors to set up tents along the quaint streets. You need to plan on at least 2 hours to see everything and add an hour if you plan lunch. They also set up this food court in the square and there were many people eating everything fried and more. One restaurant I looked at appeared nearly full by 11:30. The vendors sold high end Jewelery and art well as medium priced items, there were only a couple that sold the lower priced items. 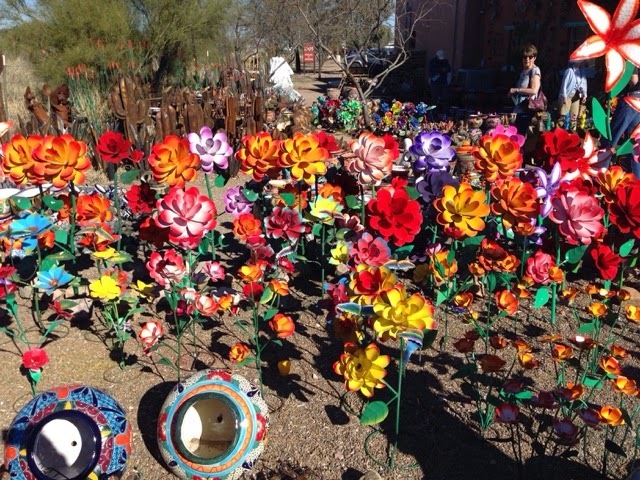 This colorful picture of yard Art was at one of the permanate stores. After attending the Fair I decided to drive to Nogalas. AZ that is only like 15 miles further down I19 as I had never been before. 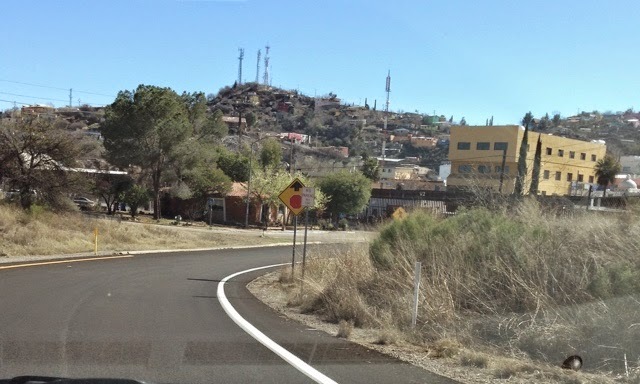 If you look closely to the left side of the picture where the road turns you will see a line of trees and the brown international border next to it that separates the AZ Nogalas from the Mecican town of the same name. Here is the international wall with the buildings in Mecico on the other side. 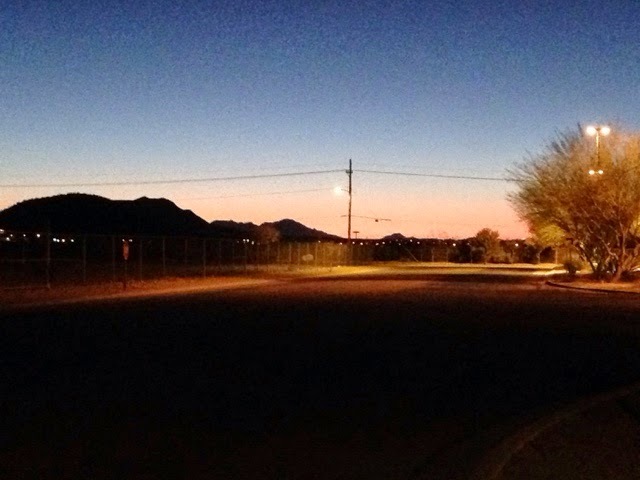 I drove through the center of Nogalas as I headed back north to Tucson. 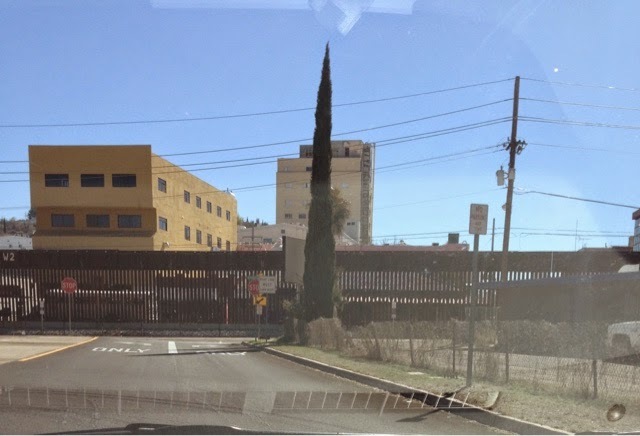 Like the US side of Tijuana they have a look on the U.S. side that copies some of the looks from the mexican side. In my opinion it looks warn and not well maintained. Upon retiring to Tucson I went to the park and made some lunch and was entertained by two teenagers fist fighting saying some very bad things to each other. Their friends who were watching stepped in when the bigger of the two made it obvious he was going to continue to pelter the smaller one. A few minutes later they were all gone.